In a massive operation against Boko Haram militants, the Nigerian military has managed to free almost 300 women, including 200 schoolgirls. However, none of them turned out to be from a group of young Chibok victims who were kidnapped last April. “The troops rescued 200 abducted girls and 93 women,” Colonel Sani Usman told Reuters in a text message. They were not from the village of Chibok from which 219 girls were abducted, the colonel added. 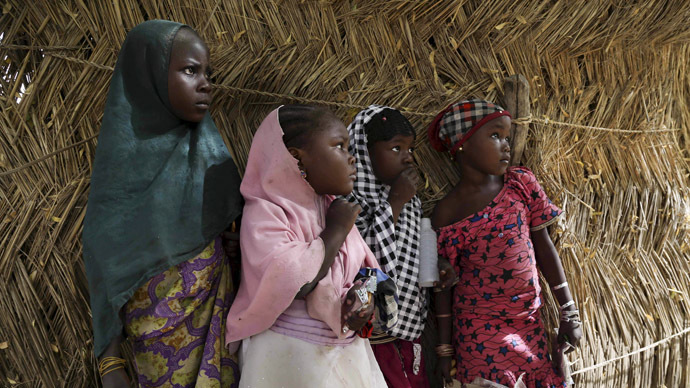 The case instigated a global ‘Bring Back Our Girls’ campaign last year. Nigerian forces engaged and destroyed three major camps of Boko Haram in their stronghold in the Sambisa Forest. The raid was also conducted on Tokumbere camp. Authorities are yet to confirm the identities of the freed persons, as all of them are being screened, authorities said earlier. “We are yet to determine their origin as all the freed persons are now being screened and profiled. Please don’t misquote me on their origin. We will provide more details later,” Director of Defence Information, Major-General Chris Olukolade said. Over the last six years, Boko Haram has killed more than 13,000 people in an effort to establish an Islamic caliphate in northeastern Nigeria. Boko Haram started its insurgency after an uprising in 2009, when they began carrying out massacres, kidnappings and raids. The group has recently pledged allegiance to the Islamic State jihadist group in Syria and Iraq.